Lunzygras: What I learned. snow edition. What I learned. snow edition. My entire livelihood has been dependent upon snow. BigBoy has been out of school for two straight weeks. This will most likely be our snowiest season ever. I've become quite the stalker on weather.com and NOAA's weather.gov. I've basically reverted back to more homeschool-like days/activities. we've kept busy. tried to enjoy the extra time together. and we've all been learning everyday. including me. I'm not a weather wimp, just a bundle-up wimp. It's too much for me to deal with getting a 3 y.o. outside (after spending 45 minutes to locate and put on all the needed cold weather items) to find out she wants to go back inside after 10 whole minutes. Truth be told, she's not that into hanging out, playing in the snow. All she really wants is to officially be "playing outside in the snow" (i.e. touch some snow and go) so she gets the coveted Hot Cocoa with marshmallows. I'm really AM a planner at heart. Snow days are no big deal if I actually know about them ahead of time. Week 1 was miserable. We found out about not having school the night before at around 6 p.m. Week 2 we figured the week was a wash with snowdays and guess what? we had fun. and the days were slightly organized. and we didn't go crazy. 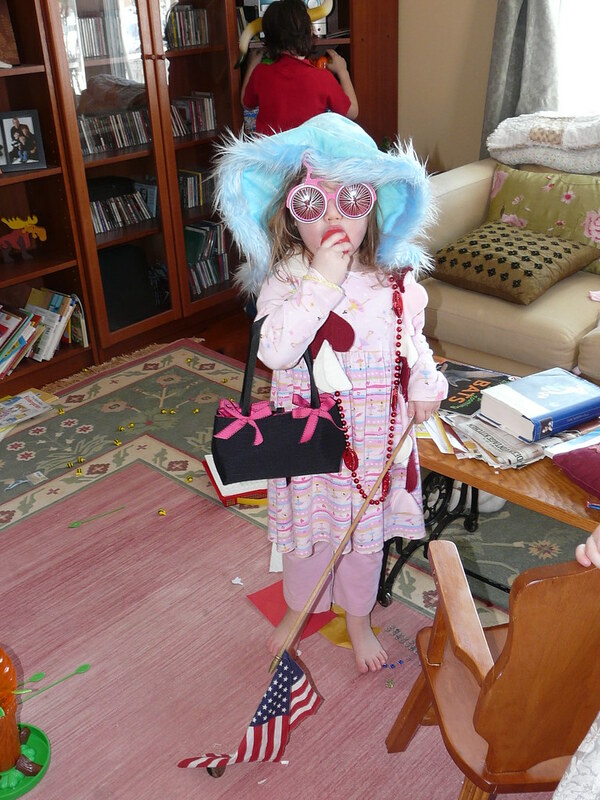 Sassy looks fabulous in Elton John-esque glasses. I miss tweeting on Twitter. Messed up granola bars still taste fabulous. I might not need to spend so much time at the grocery store. Grabbing only what we really needed from the store has been an eye opener. Milk, eggs, bread (seriously) plus lots of produce. And that's really about it. A few beans/lentils here and there. Granted, we have a freezer full of stuff, lots of pantry staples, but still. Given the time and lack of children, I would have spent more. I am waaay under budget for this month. We do eat better when I can spend more time focused on it, but I think I can come up with a better happy medium. Math and Science is way more fun when you get to eat your lesson. Kahlua is d'lish with snow cream. I've made some pretty wonderful friends. This would have been miserable to deal with alone with two small kids. But we have great friends here now. People who make up my support network. Our neighbors, other parents, BigDaddy's co-workers. all of us get through these things because we pitch in, join forces and see our way to the other side. We help each other with kids, shoveling, trips to the store, phone trees for yet another cancellation. It takes a village...honestly. So here I am once again. Will we? Won't we? Officially we have a two-hour delay, but according to my sources, we should be getting more snow. If the bus actually shows up, I'm taking off as soon as it leaves my walkway. Sassy and I have a postponed lesson on economics today. A field trip to Target. Great blog today. It was 80 here today. I am glad you are so creative with your kids. I would be in my bed with everyone in there with me and watching movies and eating crap. You are a good Mommy. Madge- thanks! I heard about the weather. Thankfully all the complaining from my California friends will stop for a while. ;) BigBoy announced to me last night that he wishes we could have one day of winter, then fall, then summer, then spring. Then start over again. "I looove the seasons!" That's my boy!